Pansement hémostatique: Emploi ciblé pour les + graves ? Catastrophic haemorrhage in military major trauma patients: a retrospective database analysis of haemostatic agents used on the battlefield. Une publication qui mettrait en évidence l'intérêt des pansements hémostatiques avec une amélioration de la survie des blessés les plus graves. A prendre quand même avec de beaucoup de recul car les derniers blessés inclus le sont sur une période de plus de 10 ans et qu'entre temps beaucoup d'évolution ont eu lieu tant sur la stratégie de prise en charge que les pansements hémostatiques notamment pour le QUIKCLOT concurrent américain du CELOX qui lui est britannique. Par ailleurs les groupes sont stratifiés par index global de sévérité sans que l'on ait une idée sur la nature des lésions ayant motivé leur emploi? Comme pour les tourniquets où les contrefaçons foisonnent, les enjeux financiers liés à la promotion de tel pansement ou d'un autre sont colossaux dès lors que le marché civil s'ouvre à eux. Une publication dont l'impartialité est à remettre en cause. On rappelle quand même qu'un bon packing de plaie avec un bon pansement compressif représentent la base. Catastrophic haemorrhage is a leading cause of morbidity and mortality in trauma, in both military and civilian settings. There are numerous studies looking at the effectiveness of different haemostatic agents in the laboratory but few in a clinical setting. This study analyses the use of haemostatic dressings used in patients injured on the battlefield and their association with survival. A retrospective database review was undertaken using the UK Joint Theatre Trauma Registry from 2003 to 2014, during combat operations in Iraq and Afghanistan. Data included patient demographics, the use of haemostatic dressings, New Injury Severity Score (NISS) and patient outcome. Of 3792 cases, a haemostatic dressing was applied in 317 (either Celox, Hemcon or Quickclot). When comparing patients who had a haemostatic dressing applied versus no haemostatic agent, there was a 7% improvement in survival. Celox was the only individual haemostatic dressing that was associated with a statistically significant improvement in survival, which was most apparent in the more severely injured (NISS 36-75). We have shown an association between use of haemostatic agents and improved survival, mostly in those with more severe injuries, which is particularly evident in those administered Celox. This supports the continued use of haemostatic agents as part of initial haemorrhage control for patients injured in conflict and suggests that civilian organisations that may need to deal with patients with similar injury patterns should consider their use and implementation. 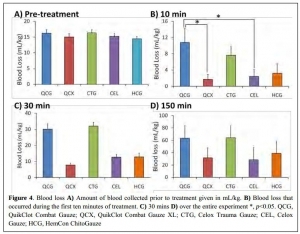 Comparison of Celox-A, ChitoFlex, WoundStat, and combat gauze hemostatic agents versus standard gauze dressing in control of hemorrhage in a swine model of penetrating trauma. Le contenu de cet article est un peu ancien (1, 2, 3, 4) mais il n'est pas inutile de rappeler son contenu. L'apport des pansements hémostatiques reste incertain et ne doit pas occulter l'importance du packing de plaie avec de la gaze standard et la réalisation de pansements compressifs. C'est tout l'intérêt du pansement OLAES Modular bandage que de permettre cela. Uncontrolled hemorrhage remains one of the leading causes of trauma deaths and one of the most challenging problems facing emergency medical professionals. Several hemostatic agents have emerged as effective adjuncts in controlling extremity hemorrhage. However, a review of the current literature indicates that none of these agents have proven superior under all conditions and in all wound types. This study compared several hemostatic agents in a lethal penetrating groin wound model where the bleeding site could not be visualized. A complex groin injury with a small penetrating wound, followed by transection of the femoral vessels and 45 seconds of uncontrolled hemorrhage, was created in 80 swine. The animals were then randomized to five treatment groups (16 animals each). Group 1 was Celox-A (CA), group 2 was combat gauze (CG), group 3 was Chitoflex (CF), group 4 was WoundStat (WS), and group 5 was standard gauze (SG) dressing. Each agent was applied with 5 minutes of manual pressure. Hetastarch (500 mL) was infused over 30 minutes. Hemodynamic parameters were recorded over 180 minutes. Primary endpoints were attainment of initial hemostasis and incidence of rebleeding. Overall, no difference was found among the agents with respect to initial hemostasis, rebleeding, and survival. Localizing effects among the granular agents, with and without delivery mechanisms, revealed that WS performed more poorly in initial hemostasis and survival when compared to CA. In this swine model of uncontrolled penetrating hemorrhage, SG dressing performed similarly to the hemostatic agents tested. This supports the concept that proper wound packing and pressure may be more important than the use of a hemostatic agent in small penetrating wounds with severe vascular trauma. Xgauze: Avancée ou bon marketing ? 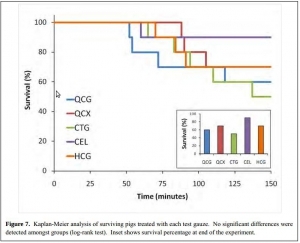 Comparison of novel hemostatic dressings with QuikClot combat gauze in a standardized swine model of uncontrolled hemorrhage. L'emploi des pansements hémostatiques en médecine de l'avant est devenue une pratique courante, même si cette dernière s'appuie sur relativement peu d'arguments avérés. Leur efficacité repose sur leur application au contact de la lésion qui saigne et une compression initiale. Hors ces deux critères de performance sont pas toujours remplis en condition de combat. C'est ce qui explique que certains soient relativement critiques par rapport à leur intérêt réel en condition de combat et on insiste beaucoup actuellement sur la notion de pansement compressif et de packing de plaie. Il n'en demeure pas moins indispensable de connaître ce que propose l'industrie en la matière. Le document proposé fait le point sur le différents produits utilisables. Il utilise pour cela un modèle expérimental de plaie artérielle. Sont comparés trois produits le Quikclot, le Celox et le Chitogauze. 5 versions au total sont analysées car le Quikclot et le Celox sont proposés en deux versions qui diffèrent par leur masse. Très globalement plus la masse de produit est grande et plus l'efficacité est au rendez vous (Le Quikclot XL et le Celox, masse de 50 g de pansement) . Parmi les présentations qui proposent une masse de pansement de l'ordre de 20g l'Hemcon Chitogauze apparaît être immédiatement le plus efficace malheureusement est observé un pourcentage de resaignement élevé. Finalement de ce document on peut retenir que l'Hemcon Chitogauze, le CeloxTrauma gauze et le Quikclot Gauze ont des performances similaires. On remarque que pour le Quikclot Gauze la survie à 150 min est la plus élevée pour les pansements de 20 g, même si ceci n'est pas significatif au plan statistique. Ce dernier reste donc un très bon choix. Il est en dotation dans l'armée française . On rappelle que ce dernier existe en deux version la version rolled et la version Z folded qui est plus particulièrement mise en avant par le fabricant pour les applications militaires. With hemorrhage being the primary cause of mortality on the battlefield [1-3], wound-packing practice by US military medics in the wars since September 11, 2001, has changed from a conservative to an assertive approach. The foremost emphasis changed from preventing contamination to controlling hemorrhage. As no specific hemostatic dressings were available at the start of the wars, after such dressings were fielded, medics changed their approach by packing wounds with more gauze earlier in casualty care and deeper into subfascial cavitary wounds as a way to control hemorrhage. Although experienced medics and trainers favor an assertive approach, there is limited empirical evidence of improvements. In addition, with the development of various dressings with hemostatic properties [4-6], no systematic approach to trial wound-packing techniques easily has been developed. When a war ends and military medical care shifts toward peacetime duties and garrison work, skill sets in trauma care degrade as skill performance is less often. Furthermore, peacetime training reverts back toward everyday work such as sick call and away from future combat casualty care. The reversion tendency allows less training of new medics in combat casualty care than those who were trained during busy years of sustained combat; like nothing in peacetime, the present danger of combat during wartime focuses attention on hemorrhage control. A challenge for medics to be as well trained in peacetime in combat casualty care as during wartime is a recurring theme of military medicine. Of the medical advances in prehospital combat casualty care during the current wars, we feel that the most important are regular tourniquets, junctional tourniquets, and wound packing because of their potential capacity to save numerous casualties from the most common cause of death on the battlefield—wound exsanguination. To not backslide on these 3 skills, we continue scholarly work to refine them. We call these skills the “Big 3,” and we have published mostly on tourniquets. To stimulate development of best practices in wound packing, we now focus the present report on an introductory test method to increase awareness of knowledge gaps within the science of wound packing. use of the overwrap and no gauze; this test included no inflation of the pneumatic bladder within the overwrap. The fourth test included the gauze, the overwrap, and the inflation of the overwrap. Each test had 4 replicates. The results showed an apparent differential performance of the methods of hemorrhage control, but the test order indicated possible learning that may be a confounder. 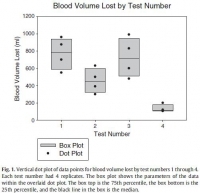 The fourth test performed better than the first 3 with respect to reduced blood loss (Fig. 1), which may mean that the fourth method is best or that the user learned with experience. Perhaps both are true. 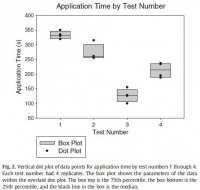 Application time also improved (Fig. 2), and the evaluation was sensitive enough to detect longer application times with additional steps in the wound-wrapping process. The strength of this report is that it introduces a method of analyzing wound-packing techniques that generated hypotheses for testing. Hypothesis-driven experiments will follow this hypothesis generating report to check differential performance of techniques such as preliminarily studied here. The method permits learning curve analysis to see how fast users can be in hemorrhage control; we have previously found that tourniquet use, for example, appears to take more than 30 tests before users flatten their learning curve . Determining optimal care techniques and training regimens may help to improve clinical performance. The limitation of the present report is its introductory design; the preliminary finding is only able to generate hypotheses. Future directions include analyses of techniques and learning curves.